"Wordsworth" redirects here. For other uses, see Wordsworth (disambiguation). For the Scottish composer, see William Wordsworth (composer). Wordsworth's magnum opus is generally considered to be The Prelude, a semiautobiographical poem of his early years that he revised and expanded a number of times. It was posthumously titled and published, before which it was generally known as "the poem to Coleridge". Wordsworth was Britain's Poet Laureate from 1843 until his death from pleurisy on 23 April 1850. The second of five children born to John Wordsworth and Ann Cookson, William Wordsworth was born on 7 April 1770 in Wordsworth House in Cockermouth, Cumberland, part of the scenic region in northwestern England known as the Lake District. His sister, the poet and diarist Dorothy Wordsworth, to whom he was close all his life, was born the following year, and the two were baptised together. They had three other siblings: Richard, the eldest, who became a lawyer; John, born after Dorothy, who went to sea and died in 1805 when the ship of which he was captain, the Earl of Abergavenny, was wrecked off the south coast of England; and Christopher, the youngest, who entered the Church and rose to be Master of Trinity College, Cambridge. Wordsworth's father was a legal representative of James Lowther, 1st Earl of Lonsdale and, through his connections, lived in a large mansion in the small town. He was frequently away from home on business, so the young William and his siblings had little involvement with him and remained distant from him until his death in 1783. However, he did encourage William in his reading, and in particular set him to commit to memory large portions of verse, including works by Milton, Shakespeare and Spenser. William was also allowed to use his father's library. William also spent time at his mother's parents' house in Penrith, Cumberland, where he was exposed to the moors, but did not get along with his grandparents or his uncle, who also lived there. His hostile interactions with them distressed him to the point of contemplating suicide. Wordsworth was taught to read by his mother and attended, first, a tiny school of low quality in Cockermouth, then a school in Penrith for the children of upper-class families, where he was taught by Ann Birkett, who insisted on instilling in her students traditions that included pursuing both scholarly and local activities, especially the festivals around Easter, May Day and Shrove Tuesday. Wordsworth was taught both the Bible and the Spectator, but little else. It was at the school in Penrith that he met the Hutchinsons, including Mary, who later became his wife. After the death of his mother, in 1778, Wordsworth's father sent him to Hawkshead Grammar School in Lancashire (now in Cumbria) and sent Dorothy to live with relatives in Yorkshire. She and William did not meet again for another nine years. Wordsworth made his debut as a writer in 1787 when he published a sonnet in The European Magazine. That same year he began attending St John's College, Cambridge. He received his BA degree in 1791. He returned to Hawkshead for the first two summers of his time at Cambridge, and often spent later holidays on walking tours, visiting places famous for the beauty of their landscape. In 1790 he went on a walking tour of Europe, during which he toured the Alps extensively, and visited nearby areas of France, Switzerland, and Italy. In November 1791, Wordsworth visited Revolutionary France and became enchanted with the Republican movement. He fell in love with a French woman, Annette Vallon, who in 1792 gave birth to their daughter Caroline. Financial problems and Britain's tense relations with France forced him to return to England alone the following year. The circumstances of his return and his subsequent behaviour raised doubts as to his declared wish to marry Annette, but he supported her and his daughter as best he could in later life. The Reign of Terror left Wordsworth thoroughly disillusioned with the French Revolution and the outbreak of armed hostilities between Britain and France prevented him from seeing Annette and his daughter for some years. With the Peace of Amiens again allowing travel to France, in 1802 Wordsworth and his sister Dorothy visited Annette and Caroline in Calais. The purpose of the visit was to prepare Annette for the fact of his forthcoming marriage to Mary Hutchinson. Afterwards he wrote the sonnet "It is a beauteous evening, calm and free," recalling a seaside walk with the 9-year-old Caroline, whom he had never seen before that visit. Mary was anxious that Wordsworth should do more for Caroline and upon Caroline's marriage, in 1816, when Wordsworth settled £30 a year on her (equivalent to £1360 as of the year 2000). The payments continued until 1835, when they were replaced by a capital settlement. The year 1793 saw the first publication of poems by Wordsworth, in the collections An Evening Walk and Descriptive Sketches. In 1795 he received a legacy of 900 pounds from Raisley Calvert and became able to pursue a career as a poet. It was also in 1795 that he met Samuel Taylor Coleridge in Somerset. The two poets quickly developed a close friendship. In 1797, Wordsworth and his sister Dorothy moved to Alfoxton House, Somerset, just a few miles away from Coleridge's home in Nether Stowey. Together Wordsworth and Coleridge (with insights from Dorothy) produced Lyrical Ballads (1798), an important work in the English Romantic movement. The volume gave neither Wordsworth's nor Coleridge's name as author. One of Wordsworth's most famous poems, "Tintern Abbey", was published in this collection, along with Coleridge's "The Rime of the Ancient Mariner". The second edition, published in 1800, had only Wordsworth listed as the author, and included a preface to the poems. It was augmented significantly in the next edition, published in 1802. In this preface, which some scholars consider a central work of Romantic literary theory, Wordsworth discusses what he sees as the elements of a new type of verse, one that is based on the "real language of men" and avoids the poetic diction of much 18th-century verse. Wordsworth also gives his famous definition of poetry as "the spontaneous overflow of powerful feelings: it takes its origin from emotion recollected in tranquility," and calls his own poems in the book "experimental". A fourth and final edition of Lyrical Ballads was published in 1805. Between 1795-97, Wordsworth wrote his only play, The Borderers, a verse tragedy set during the reign of King Henry III of England, when Englishmen in the North Country came into conflict with Scottish rovers. He attempted to get the play staged in November 1797, but it was rejected by Thomas Harris, the manager of the Covent Garden Theatre, who proclaimed it "impossible that the play should succeed in the representation". The rebuff was not received lightly by Wordsworth and the play was not published until 1842, after substantial revision. Wordsworth, Dorothy and Coleridge travelled to Germany in the autumn of 1798. While Coleridge was intellectually stimulated by the journey, its main effect on Wordsworth was to produce homesickness. During the harsh winter of 1798–99 Wordsworth lived with Dorothy in Goslar, and, despite extreme stress and loneliness, began work on the autobiographical piece that was later titled The Prelude. He wrote a number of other famous poems in Goslar, including "The Lucy poems". In the Autumn of 1799, Wordsworth and his sister returned to England and visited the Hutchinson family at Sockburn. When Coleridge arrived back in England he travelled to the North with their publisher Joseph Cottle to meet Wordsworth and undertake a proposed tour of the Lake District. This was the immediate cause of the siblings settling at Dove Cottage in Grasmere in the Lake District, this time with another poet, Robert Southey nearby. Wordsworth, Coleridge and Southey came to be known as the "Lake Poets". Throughout this period many of Wordsworth's poems revolved around themes of death, endurance, separation and grief. Isabella Curwen (d. 1848) had six children: Jane, Henry, William, John, Charles and Edward. Mary Ann Dolan (d. after 1858) had one daughter Dora (b. 1858). Dora Wordsworth (16 August 1804 – 9 July 1847). Married Edward Quillinan in 1843. Thomas Wordsworth (15 June 1806 – 1 December 1812). Catherine Wordsworth (6 September 1808 – 4 June 1812). Wordsworth had for years been making plans to write a long philosophical poem in three parts, which he intended to call The Recluse. In 1798–99 he started an autobiographical poem, which he referred to as the "poem to Coleridge" and which he planned would serve as an appendix to a larger work called The Recluse. In 1804 he began expanding this autobiographical work, having decided to make it a prologue rather than an appendix. He completed this work, now generally referred to as the first version of The Prelude, in 1805, but refused to publish such a personal work until he had completed the whole of The Recluse. The death of his brother John, also in 1805, affected him strongly and may have influenced his decisions about these works. Wordsworth's philosophical allegiances as articulated in The Prelude and in such shorter works as "Lines written a few miles above Tintern Abbey" have been a source of critical debate. It was long supposed that Wordsworth relied chiefly on Coleridge for philosophical guidance, but more recently scholars have suggested that Wordsworth's ideas may have been formed years before he and Coleridge became friends in the mid-1790s. In particular, while he was in revolutionary Paris in 1792 the 22-year-old Wordsworth made the acquaintance of the mysterious traveler John "Walking" Stewart (1747–1822), who was nearing the end of his thirty years of wandering, on foot, from Madras, India, through Persia and Arabia, across Africa and Europe, and up through the fledgling United States. By the time of their association Stewart had published an ambitious work of original materialist philosophy entitled The Apocalypse of Nature (London, 1791), to which many of Wordsworth's philosophical sentiments may well be indebted. In 1807 Wordsworth published Poems in Two Volumes, including "Ode: Intimations of Immortality from Recollections of Early Childhood". Up to this point Wordsworth was known only for Lyrical Ballads, and he hoped that this new collection would cement his reputation. Its reception was lukewarm, however. In 1810, Wordsworth and Coleridge were estranged over the latter's opium addiction, and in 1812, his son Thomas died at the age of 6 followed six months later by the death of 3-year-old Catherine. The following year he received an appointment as Distributor of Stamps for Westmorland, and the stipend of £400 a year made him financially secure. 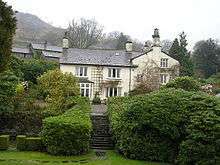 In 1813, he and his family, including Dorothy, moved to Rydal Mount, Ambleside (between Grasmere and Rydal Water), where he spent the rest of his life. Some modern critics suggest that there was a decline in his work, beginning around the mid-1810s, perhaps because most of the concerns that characterised his early poems (loss, death, endurance, separation and abandonment) has been resolved in his writings and his life. By 1820, he was enjoying considerable success accompanying a reversal in the contemporary critical opinion of his earlier works. Following the death of his friend the painter William Green in 1823, Wordsworth also mended his relations with Coleridge. The two were fully reconciled by 1828, when they toured the Rhineland together. Dorothy suffered from a severe illness in 1829 that rendered her an invalid for the remainder of her life. Coleridge and Charles Lamb both died in 1834, their loss being a difficult blow to Wordsworth. The following year saw the passing of James Hogg. Despite the death of many contemporaries, the popularity of his poetry ensured a steady stream of young friends and admirers to replace those he lost. Wordsworth remained a formidable presence in his later years. In 1837, the Scottish poet and playwright Joanna Baillie reflected on her long acquaintance with Wordsworth. "He looks like a man that one must not speak to unless one has some sensible thing to say. however he does occasionally converse cheerfully & well; and when one knows how benevolent & excellent he is, it disposes one to be very much pleased with him." In 1838, Wordsworth received an honorary doctorate in Civil Law from the University of Durham and the following year he was awarded the same honorary degree by the University of Oxford. In 1842, the government awarded him a Civil List pension of £300 a year. Following the death of Robert Southey in 1843 Wordsworth became Poet Laureate. He initially refused the honour, saying that he was too old, but accepted when the Prime Minister, Robert Peel, assured him that "you shall have nothing required of you". Wordsworth thus became the only poet laureate to write no official verses. The sudden death of his daughter Dora in 1847 at the age of only 42 was difficult for the aging poet to take and in his depression, he completely gave up writing new material. 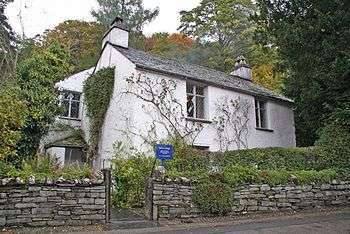 William Wordsworth died at home at Rydal Mount from an aggravated case of pleurisy on 23 April 1850, and was buried at St Oswald's Church, Grasmere. His widow Mary published his lengthy autobiographical "poem to Coleridge" as The Prelude several months after his death. Though it failed to arouse much interest at that time, it has since come to be widely recognised as his masterpiece. "Strange fits of passion have I known"
"I Wandered Lonely as a Cloud" Also known as "Daffodils"
" To the Cuckoo "
↑ "Poet Laureate", The British Monarchy official website. ↑ Appendix A (Past Governors) of Allport, D. H., & N. J. Friskney, A Short History of Wilson's School, Wilson's School Charitable Trust, 1986. ↑ Moorman 1968 pp. 5–7. ↑ "Wordsworth, William (WRDT787W)". A Cambridge Alumni Database. University of Cambridge. 1 2 3 4 5 6 7 8 Everett, Glenn, "William Wordsworth: Biography" at The Victorian Web, accessed 7 January 2007. ↑ "Purchasing Power of British Pounds from 1245 to Present". MeasuringWorth.com. Retrieved 28 May 2012. ↑ "The Cornell Wordsworth Collection". Cornell University. Retrieved 13 February 2009. ↑ Wordsworth, William (1802). Lyrical Ballads with Pastoral and other Poems. I (3 ed.). London: Printed for T.N. Longman and O. Rees. Retrieved 13 November 2014. via archive.org. ↑ Wordsworth, William (1805). Lyrical Ballads with Pastoral and other Poems. I (4 ed.). London: Printed for Longman, Hurst, Rees, and Orme, by R. Taylor. Retrieved 13 November 2014. via archive.org. ↑ Stephen Gill, William Wordsworth: A Life, Oxford University Press, 1989, pp. 132–133. ↑ Recollections of the Lake Poets. ↑ Hartman, Geoffrey (1987). Wordsworth's Poetry, 1787-1814. New Haven: Yale University Press. pp. 329–331. ISBN 9780674958210. ↑ Baillie, Joanna (2010). Thomas McLean, ed. Further Letters of Joanna Baillie. Madison, NJ: Fairleigh Dickinson University Press. p. 181. ISBN 978-0-8386-4149-1. ↑ Stephen Gill, William Wordsworth: A Life, Oxford University Press, 1989, pp. 422—3. 1 2 3 4 5 M. H. Abrams, editor of The Norton Anthology of English Literature: The Romantic Period, writes of these five poems: "This and the four following pieces are often grouped by editors as the 'Lucy poems,' even though 'A slumber did my spirit seal' does not identify the 'she' who is the subject of that poem. All but the last were written in 1799, while Wordsworth and his sister were in Germany, and homesick. There has been diligent speculation about the identity of Lucy, but it remains speculation. The one certainty is that she is not the girl of Wordsworth's 'Lucy Gray'" (Abrams 2000). Report to Wordsworth, Written by Boey Kim Cheng, as a direct reference to his poems "Composed Upon Westminster Bridge" and "The World Is Too Much with Us"
"Archival material relating to William Wordsworth". UK National Archives. "Three years she grew in sun and shower"
"Lines written a few miles above Tintern Abbey"
"Character of the Happy Warrior"